Imagine sheets that combine a puppy, a kitten, snowflakes, custard, a super plush yoga shirt and you have Bare Bottom® Sheets! When shopping for your college essentials, don't forget about your necessary dorm room Full bedding! You'll need a few very important Full bedding pieces in order to properly outfit your Full sized dorm bed. 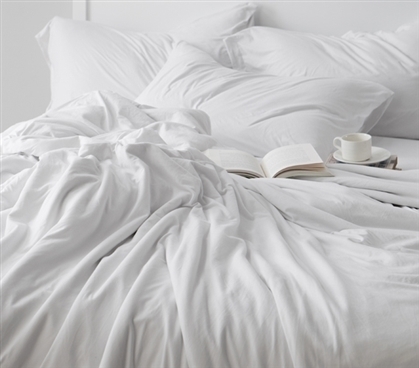 Of course, your cozy college comforter is a must have, but what if your dorm sheets could make a huge impact on the comfort of your Full size bed? Well, now they can! Our Bare Bottom Sheets - All Season - Full Bedding - White will give you comfortably soft dorm room bedding that will feel out of this world! Our Bare Bottom Full sheets are made up of a super soft microfiber material that will give you luxuriously comfy Full sized bedding. You'll absolutely love the feel of your college bedding when you add this silky smooth Full sheet set to your Full bed. Complete with a Full fitted sheet, a flat oversized Full sheet, and (2) pillowcases, you'll be able to completely surround yourself with the ultimate in college comfort. These white dorm sheets will also make it easy for you to blend your Twin XL bedding with the rest of your college decor!